What do you mean with "this is the gel"? From a technical perspective, traditional "gels" are water and carbohydrates simply mixed into syrups, often containing added flavors and preservatives. The GEL 100 is completely different. It’s a hydrogel – a biopolymer matrix, filled with a unique blend of glucose and fructose (ratio of 0.8:1) which enables uptakes of up to 100 grams of carbohydrates per hour. How does the Gel 100 work? The GEL 100 is a hydrogel – a biopolymer matrix that holds carbohydrates. It relies on the same concept as our drinks where the hydrogel technology enables a smoother transportation of carbohydrates. Why the GEL 100, I like your drinks? We think that the GEL 100 is a simple way to carry some energy with us on a run, ride or other activity. 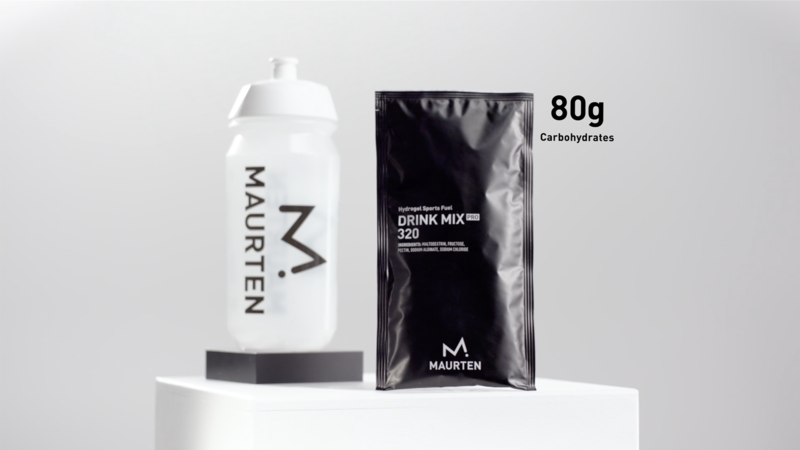 Most of us do not get a bottle of Maurten Drink mix handed every 15 minutes – but most of us can easily carry bunch of gels while running or biking. Can I combine the GEL 100 with the drinks? Yes, you can combine the GEL 100 with our sports drinks, actually that is how most of our pro athletes are using the products. What's different about Maurten's sports drink? Normally, as soon as the concentration of carbohydrate in a drink is increased, gastric emptying slows down – resulting in less fluid and carbohydrate delivery to the body. The stomach problems caused by this have been a significant issue for many athletes. At Maurten, we’ve found a way to avoid these problems by using hydrogel technology. This has enabled us to develop sports energy products with high carbohydrate concentrations. Some of the best runners in the world are now using our products, both during training and races. HOW DOES THE HYDROGEL sports drink WORK? The sports drink instantly converts to hydrogel in the acidity of the stomach. The hydrogel enables a smooth transportation of the drink through the stomach to the intestine where the water, salt and carbohydrates are released and absorbed. Giving you a fast and large supply of energy that your body can tolerate. Find out more about the hydrogel technology here. WHY USE Maurten's SPORTS FUELS? The hydrogel technology encapsulates high concentrations of carbohydrates to fuel during activity. We only use food-graded ingredients and there are no added flavors, colorants or preservatives. Nothing more and nothing less than what’s needed. How to use Maurten Sports drink? WHAT INGREDIENTS ARE IN YOUR SPORTS FUELS? The products only contain natural ingredients – all well-established and food-graded. Our Drink mixes contain maltodextrin, fructose, pectin, sodium alginate and sodium chloride (salt). The Gel 100 contain water, glucose, fructose, calcium carbonate, gluconic acid and sodium alginate. Find out more on our Innovation page. What water should I use for my sports drink? Our hydrogel sports drink is advanced and the function rely on precise circumstances. We recommend you to not mix it with water with high levels of minerals (>40mg/L calcium). High calcium concentrations make the drink mix hard to dissolve. Yes, samples from every batch have been, and will be, sent for screening by independent third party laboratories. All Maurten suppliers are certified according to the international FSSC 22000 standard. ARE THE Products ONLY FOR ELITE ATHLETES? No, the products are for everyone – from elite athletes to amateurs. Yes, all our products are vegan, yet not certified. We are now shipping to addresses within the European Union and the United States. Sign up to our Newsletter for information about new markets. Yes, we have filed several patent applications to protect the technology.